Large Features and Focal Points, Really? Going on previous knowledge it's understandable that you think the best small apartment decorating ideas stem from using half-sized furniture, and banishing all knick-knacks to your ever-so-organized storage boxes. It may surprise you to learn then, that using small furniture in a room, and small patterns on the wall actually only makes the space feel smaller. We'll get onto the use of pattern and color on the walls later, but before you think about that, have a think about planning your space. Draw up a quick room plan and see if there are any wasted areas you could be making use of. Create rough (but to scale) paper pieces of your furniture and move them around your room to see how they look -- think about the opening of doors and the flow of traffic, but other than that anything goes. It's a lot easier to move bits of paper around then to keep moving hefty pieces of furniture. Try using pedestal type tables that give you a large table top surface, but don't crowd the underneath of the table with more than one leg; this creates an instant feeling of space as well as being useful. Why not make your kitchen into an eat-in kitchen, freeing up space in the living quarters and giving a more cozy family feel to meal times. Decorating a small apartment doesn't mean you have to stick with bland walls in light colors; there is room for pattern anywhere, and in fact you can use this to your advantage. And while it's definitely advisable to stick to the same color, you don't have to opt for cream or white. Of course there are a few rules to bear in mind; after all who would want all four walls painted in yellow, even if it does expand the space. You can either choose to use any of these colors with white; maybe using a picture rail and painting this white, or painting the wall space above the wall in white, or else use different tones of your chosen color. 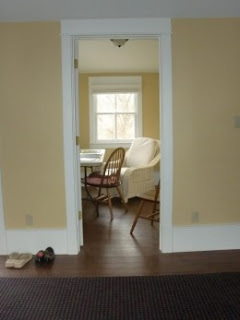 So use a sunny yellow as a feature wall, and paler lemon yellow on the other walls. You can even add more depth to your wall by using a rag rolling technique which also creates the illusion of more space rather than flat color. Metallics are also popular color trends in decorating at the moment, so try to introduce them in either the form of patterns on wallpaper or as small blocks of color on the wall -- not only fashionable but creates reflection of light too. Stay away from small patterns as these actually make a room feel smaller. Instead opt for the current trend of large modern florals and leaves. Luckily for you, horizontal stripes (a well know trick for expanding the feeling of width in a room) is a hot option, even available in metallic wallpaper designs. Storage is a big issue for all of us, especially when living in small apartments, so it's no wonder we get hung up on clutter and having storage for everything. The problem with this is that we then tend to opt for block type furniture that hides mess behind, or within it, and unusual corners and spaces are piled high with storage boxes or ill-fitting bookshelves. If you make use of the "space" that these corners and alcoves present, rather than using them as storage, you will reap the rewards. 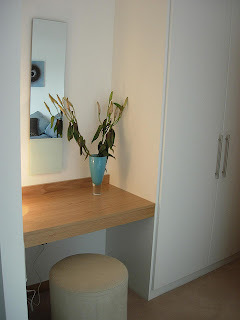 An alcove can easily become a home office, dressing table or fireplace. Not only are you then decluttering these areas you are creating a useful area, and making the statement "look I even have room for a desk in this space!" Adding some DIY metal wall art or a long mirror will also draw the eye to the space you have created. So what about my storage space, I hear you cry. Look for dual purpose furniture where you can, or again use the trick of utilizing hidden spaces. The back of cupboard doors are a wasted space, but with the addition of a hanging fabric organizer or metal hooks there are storage spaces to be found. 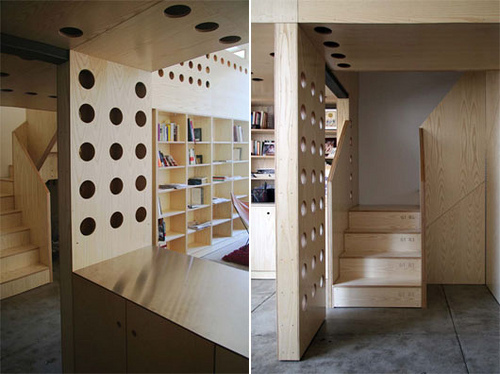 Shelving over the tops of doors is also a hidden space just begging to be used. Even in small living areas there is room for dividing the space up into zones depending on their use. In short, you don't have to live "bedsit" style, with every area open and on top of each other -- this really does create a cluttered look. If you don't have any alcoves or hiding spaces, then make some. You can purchase screens plain from DIY stores and paint them up yourself, opt for thrift store finds, or erect something a little more permanent in the way of wooden room dividers with holes or trellis effect between the frames, or even walls made of glass blocks. The options pictured work so well because they let light through, and don't create such a definite block that screens out everything else, so you get a nice feeling of space beyond the divide. If you're after advice on how to decorate a small apartment with a balcony then you have a great deal of positives going for you already. 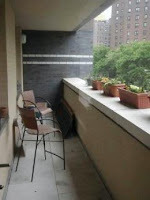 Not only does the balcony offer space to look out on from your small apartment (therefore making the apartment feel larger), but you also have some nice balcony space to utilize too. If you have a decent sized balcony think about how you can use this to your advantage. Is there space for a bench with storageunderneath for outdoor items or tools? Do you have a bricked or smooth area that could be painted? If you paint the visible part of the balcony in the same color as the room it connects to, this creates an even greater feeling of space; almost bringing the outdoors in. Maybe you have room for some trellis and a window box to grow your own herbs or ornamental plants. Make use of the balcony so even in the depths of winter you have something nice to look out on, extending the four walls of your apartment. Next to the balcony doors think about your window treatments. Make sure they are long and are hung from ceiling to floor. If you have room either side of the door then why not put up a mirror each side and treat it like a window - using the same curtains around the mirror as you have for the door. Think of your balcony as another room in your apartment, even if you only have room for a metal chair and a plant or two. If you wanted to incorporate a theme into your apartment, then make sure you carry it through the whole apartment for a more uniform look. Using different schemes breaks up the space and makes it feel smaller. Natural themes that use the recommended color trends we spoke about before, work very well, such as the great outdoors, beach and nautical themes -- especially if you extend this out to the balcony area. 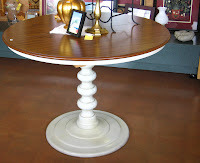 The Tuscan decorating style due to the earthy, natural colors and textures is also another good theme option. Ethnic and medieval themes should be reserved for larger areas, however. Small apartment decorating does not mean that you need to stick to a boring cookie cutter scheme for your living space. Using the tips and tricks above means you will have a revitalized space with the feeling of much more space.